Solar-powered aircraft are starting to make an impact. Take a look at solar aircraft in reality, in concept visualization, and in science fiction. The Ascent Solar Silent Sentinel is the result of a collaboration with Bye Aerospace and thin film PV manufacturer Ascent Solar. Ascent Solar is providing necessary solar energy technology to Bye Aerospace to develop a hybrid unmanned aerial vehicle (H-UAV). The aerial vehicle is named as Silent Sentinel. This aircraft will be stored using electric power, thin film solar photovoltaics (PV) and some additional technologies to enhance its low emissions, quiet operations and endurance. Bye Aerospace will also utilize a Williams International FJ33 turbofan engine for primary propulsion. 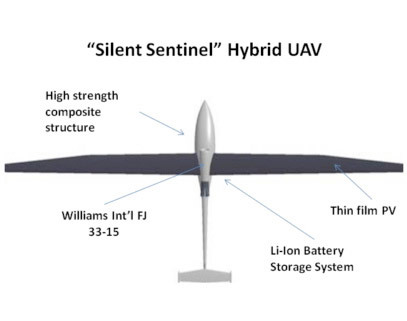 Silent Sentinel would be a robust, long-range UAV that would integrate various clean-energy features. The Solar Impulse HB-SIA was unveiled on a Swiss airfield this past summer. Dubbed the Solar Impluse HB-SIA, the airplane is designed to fly both day and night without the need for fuel and will begin test flights by year's end. Despite a wingspan equal to that of a Boeing 747, the Solar Impulse weighs only around 1.7 tons, about the same as an average car. More than 12,000 solar cells mounted on the wing supply renewable solar energy to the four 10-horsepower electric motors. 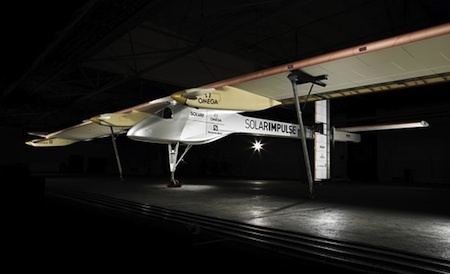 During the day, the solar panels charge the plane's lithium polymer batteries, allowing it to fly at night. The Zephyr solar plane is a 66 pound craft that is hand-launched. Its record for flight: 83 hours and 7 minutes. The plane makes use of ultra-lightweight carbon-fiber to save on weight. 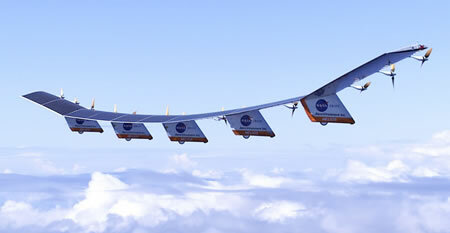 It flies on solar power generated by paper-thin silicon solar arrays on its wings. 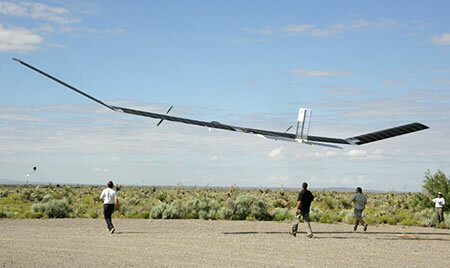 The Helios single-wing aircraft succeeded in reaching an altitude of 96,000 feet. Helios is an ultralight flying wing with 14 electric motors built by AeroVironment Inc. Helios' 247-foot wingspan exceeds that of a Boeing 747. Operating entirely under solar power (including the take-off), Helios reached an altitude just short of 100,000 feet, which broke records for non-rocket powered flight. At that altitude, Helios approached conditions for winged flights in the atmosphere of Mars. Take a look at a very nicely done visualization of a solid state flapping wing solar aircraft - the Solid State Aircraft - courtesy of the Ohio Aerospace Institute. It has inter-aircraft communication, surface communication, communication with satellites and surveillance and mapping capabilities. And, best of all, its not just of this Earth. BTW, this is the original video, without irritating voice-over. 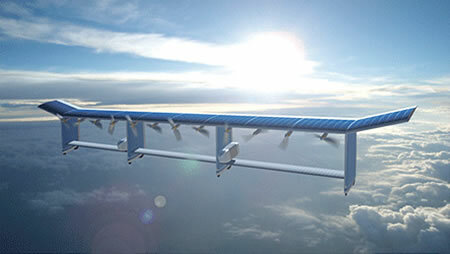 This flight vehicle would integrate airfoil, propulsion, energy production, energy storage, and control into one seamless design with no conventional mechanical moving parts. The integration of these components comprises the Solid State aircraft concept that has wide implication for terrestrial and planetary flight applications. The most innovative aspect of this concept is the use of an ionic polymeric-metal composite (IPMC) as the source of control and propulsion. This material has the unique ability to deform in the presence of an electric field like an artificial muscle, and return to its original shape when the field is removed. Combining the IPMIC with emerging thinfilm batteries and thin-film photovoltaics provides both energy source and storage in the same structure. Combining the unique characteristics of these materials enables flapping of the aircraft wing to generate the main propulsive force. With a flight profile similar to that of a hawk or eagle, the Solid State Aircraft will be able to soar for long periods of time and utilize flapping to regain lost altitude. Here's a DARPA-planned device - the VULTURE air vehicle program. The VULTURE Air Vehicle Program is an exploratory development program with the overall goal to develop and demonstrate the ability to deliver and maintain an airborne payload on station for an uninterrupted period exceeding 5 years using a heavier-than-air platform system... The Government is not interested in approaches that use either radioactive energy sources or employs any form of buoyant flight for this application. ...develop technologies and systems which will enable the Military to deliver and maintain a 1000 lb, 5 kW airborne payload for an uninterrupted period exceeding 5 years with a 99+% on station probability. See picture links above for more information on the different solar powered planes. Do you have any solar-powered aircraft favorites (in fact, concept or fiction)? Let me know and I'll add them.